I’m going to be honest with you guys: I absolutely love awards season. I love rounding my friends up and making snacks so we can enjoy the shows together, watching the red carpet and believing that — while in my pajamas — I am fully capable of being a judge on Fashion Police. And I love playing the game with my friend Molly of who can guess more winners correct. These are traditions that I firmly believe in and look forward to every year. But this year I’m not as excited as I usually am. After hearing the Golden Globes nominations, I’m sitting here wondering what the Hollywood Foreign Press Association is thinking. They’re placing movies, such as the absolute knockout debut of Jordan Peele, Get Out, in the wrong categories, overlooking some of the best films of the year (Goodbye Christopher Robin and Breathe come immediately to mind), nominating bizarre performances (Yes, I’m looking at Ansel Elgort in Baby Drive because honestly? No. ), completely shutting out Greta Gerwig for her absolutely stunning first turn as director of the incredible Lady Bird, and generally overlooking some seriously standout performances that made cinema so lovely this year. However, there’s one performance in particular that has me reeling. Sure, there are some obvious omissions such as Beanie Feldstein in Lady Bird and Andrew Garfield in Breathe, but there’s only one that really has me angry. 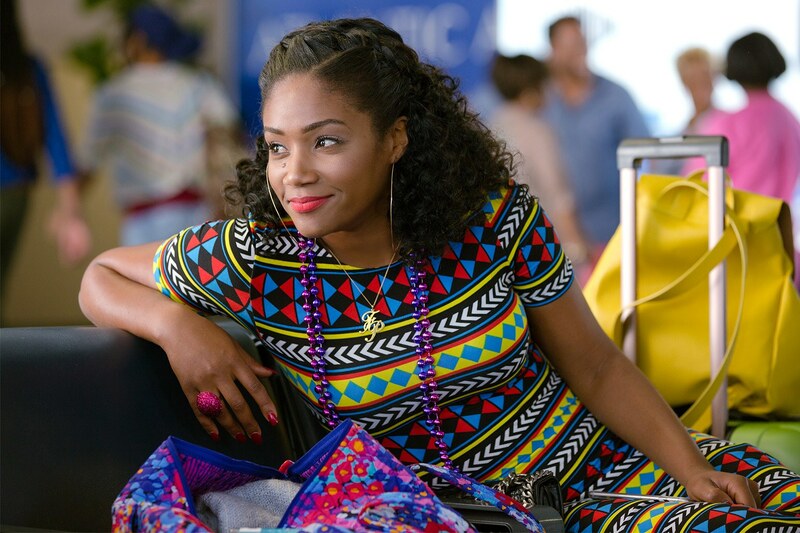 One of the best performances this year (not just comedy or drama or suspense or whatever genre), and one of the single most impressive was Tiffany Haddish in Girls Trip. Now, for those of you who have not seen Girls Trip, you’re already missing out. It’s a story that would resonate with any girl and her group of friends. It’s about four girls who met in college and have gone through the ups and downs of life together ever since. But it’s been a while since they’ve seen each other. When Ryan, the group member who has skyrocketed to fame, is asked to speak at the Essence festival, she invites her girls along — despite the years between them and drama that was the catalyst. It’s up and down, a laugh riot and a truly emotional piece of work. But it’s Tiffany Haddish’s performance that stands out above the rest. While most of us are familiar with Queen Latifah and Jada Pinkett-Smith, and while Regina Hall is a star in her own right, (and soon to star in the adaptation of one of 2017’s biggest novels The Hate U Give), it’s Haddish most of us are unfamiliar with. From the second she steps on the screen and delivers her first joke, you know she’s going to shine. She delivers each line with immense sincerity and kills every joke in the film. However, comedy is more than just making someone laugh. It’s my humble opinion (and you’re free to disagree with it) that if comedy isn’t rooted in something fundamental or doesn’t have some sort of emotional tether, it’s simply not going to work. While Haddish has you absolutely rolling in your seat and making you cry with her borderline naivete and outright candor, she was also sweet and caring, loving and understanding. After defending her friend without hesitation earlier in the film and making us laugh, it’s at the end of that night that she wants to bring the girls together to pray and thank God for bringing her very best friends together again. Her blatant sexual prowess is a riot, but after a major blowout, she reminds her friends that she would do anything for them — and be there for them no matter what. You can tell that she truly means it. So it concerns me that the Hollywood Foreign Press Aassociation would overlook such a multilayered, versatile performance. If we can nominate Melissa McCarthy for her outlandish and raunchy turn in Bridesmaids, why are we overlooking Haddish for one of the best performances, comedically, in 2017? When I watch these award shows, I want there to be equal representation. I want there to be women of all different shapes, sizes, colors, credences, and nationalities represented in the nominations. I want to know that the group of women representing in each category were chosen based not on what they’ve given to cinema over time, but what they’ve given to cinema within the confines of the awards season calendar. Overlooking this performance is downright shameful on the part of the HFPA. If you went to the movies this year or rented Girls Trip from your local library, Redbox. or your Amazon account, you know that Haddish gave an award-winning performance as Dina — the essential glue that holds the Flosse Posse together. She is the one who overlooks past mistakes and just wants to enjoy her gal pals and their precious time together. She was one of the biggest reasons why that movie was such a smash hit. In not nominating her, the HFPA proves that they care more for big, established names than they do pure, raw talent. Do I believe that some of those household names deserve to be nominated? Of course I do. Did some of the lesser-known actors creep in this year for their deserving place? Obviously. But overlooking talent like that of Tiffany Haddish is plain ignorant, to be honest. Of all of the performances, it should be her name that is in the Best Supporting Actress category. It’s ridiculous and unbelievable that her name was not roll called for her wildly deserving performance. And I know I’m not even close to the only one who believes that.